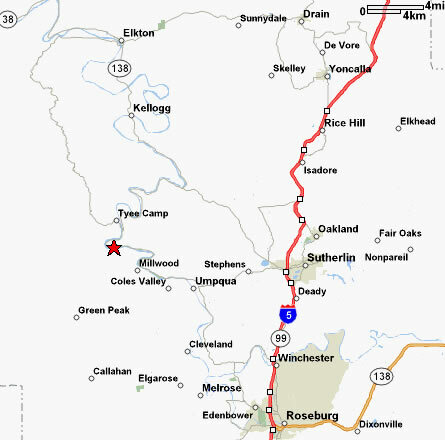 From I-5, take the Sutherlin freeway exit #136 Highway 138 to Elkton and the Coast. Turn left (West) on Highway 138. The Dairy Queen and Taco Bell will be on your right. Shortly after you pass Dakota Street Pizza, turn left on Fort McKay Road (County Road 9), and continue for six miles. Just before the Lighthouse Bakery Cafe, turn right on Tyee Road. Continue on Tyee Road for nine miles. The Haven Blueberry farm will be on your left. There is a sign.